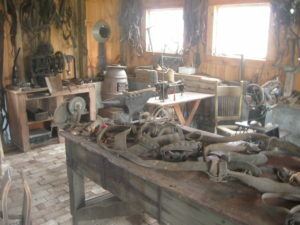 Most every town had a harness shop at one time, some towns several. Richfield’s most well known shop was run by Peter Allen. It stood at the corner of Streetsboro and Broadview Rds. 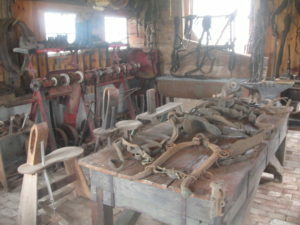 These days, early in the 21st Century, harness shops have become quite rare outside of Amish communities. 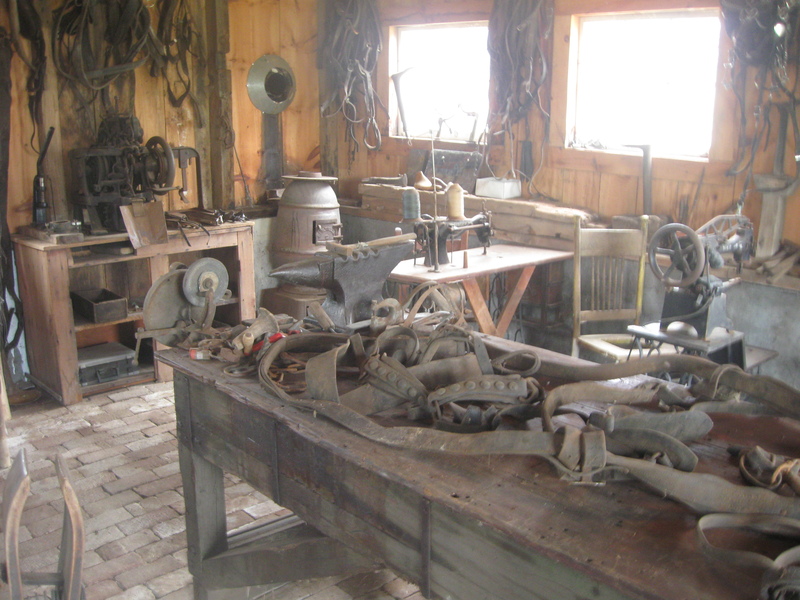 There was an old gentleman in Richfield who repaired harness and tack out of a small “yard” barn behind his house, until he finally retired in the mid ’90’s from his almost hobby like work. And years ago there was a harness shop over towards Wadsworth. But now, if you need something repaired, you have a choice of traveling north an hour to the Amish communities around Middlefield, or go south an hour to the Amish shops in Holmes County. We almost always go south. We have many Amish friends there, and we still have quite a number of Amish relatives in the Charm area (our great grandfather’s farm was just south of Charm). We have occasion to visit a number of harness & buggy shops down in the area, but our favorite is found along a long dirt road, south of Kidron. It’s run by a really nice gentleman who is there when he’s there, and isn’t when he’s not. When he’s not, you can go on down the “drive” another half mile or so to his farm. I asked him one time why he walks such a distance to go to his shop and he said he didn’t like to bother the horse. So then I asked why he didn’t ride a bicycle since it would be so much easier. He got the strangest look like he couldn’t figure out what I was talking about, then finally replied that the Bishop of the house church didn’t allow air filled tires. Over the course of years I’ve known him, he has done a great job of repairing and oiling the many sets of museum harness I have brought him. He’ll never be wealthy, he charges very little, ..in part because he only works for Amish (and me). I have also bought several other things from him, including a old, old (but still usable) heavy duty, leather sewing, treadle sewing machine. But now, at long last, the museum has it’s own harness shop. In style, look and use it greatly resembles the Peter Allen Harness Shop that operated from 1880 to 1908 in Richfield. Along the long wall are a series of windows with a sewing machine at each light. There is a large trough for dipping harness in Neats Foot oil. In one corner is a stack of trunks for sale, just as Peter sold trunks. Down the center of the shop is a nearly ancient table that has served for years as cutting and assembly bench for harness. And hanging from many metal hooks around the walls are nearly countless sets of harness and tack collected from now long gone area farms including the Mueller, King, Sebecky, Knopp, Krone and Morris Farms ..and of course others. I have wondered about all the horses that had labored under those sets of leathers. I have seen a few old pictures of a couple of them, even heard their names. But now, they and their masters are long gone and only the harness remains. I’ve spent most of the last two weeks in the “new” shop, …carting in equipment, getting it running, sorting and hanging tack. It took a couple hours just to attempt to sort, match and hang all the many hames the museum has collected. Hames come in matched sets, fitting and clamping to each side of a horse collar. Then the harness attaches to the hames so the horse can pull its load. I have several dozen of the (sometimes all wood, sometimes all metal, sometimes wood and metal mixed) devices. But I could only find three matched sets. I have no idea what the farmers I got the hames, halters and harness from did with the other half of so many of the hames. I’ve also added quite a number of shoe and boot making tools, machines and lasts, including an eight foot long shoe fitting, grinding and polishing machine. It’s rather uncommon to see those machines anymore. People just don’t much have their shoes repaired these days. Imports have made new (but much less long lasting) shoes and boots cheaper. Another couple days and it’ll be a great and interesting shop to visit. It’s a nice step in time, with the rich smells of oil, the creak of leather, the chatter of the treadle sewing machines, and the hundred year old brick floor, …all housed in one of the oldest remaining barns in Northern Ohio.